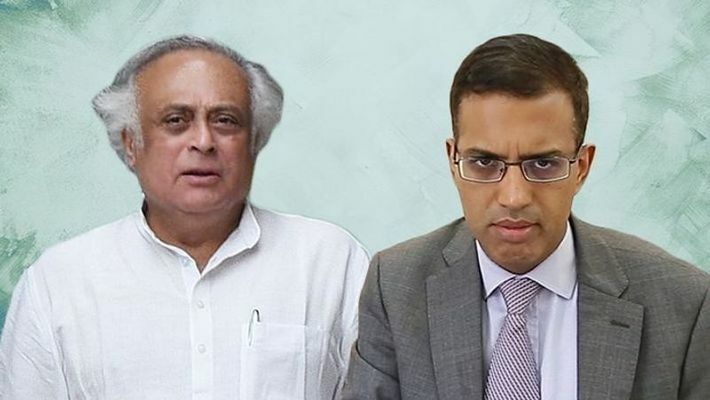 New Delhi: Vivek Doval, son of National Security Advisor Ajit Doval, has filed a criminal complaint for defamation against senior Congress leader Jairam Ramesh and the Caravan magazine for their allegation that he had set up an illegal hedge fund in the Cayman Islands. Doval Jr is suing Ramesh and the publication for having “deliberately maligned and defamed” him “seemingly to settle scores with his father”. Vivek also challenged Ramesh for a public debate on the national media to expose the “hit and run job” of the Congress leader. The controversy was kicked off with the publication of an article titled, ‘The D-Companies’ in Caravan on January 16 which was followed up by a press conference by Ramesh. The article insinuated that the hedge fund was being used for money laundering and round-tripping of black money. The article had insinuated that Vivek founded a hedge fund, GNY Asia, in the tax haven of the Cayman Islands just 13 days after demonetisation was announced by the Narendra Modi government. Calling the allegations “completely baseless”, levelled without due diligence, Vivek Doval submitted to the court the entire timeline of the formation of the fund, which prima facie undermines the claims of the Caravan article. “The entire timeline of my fund, the formal set-up of which began in March 2016 and concluded in December 2016 has been submitted to the court. The vindictiveness is demonstrated by trying to link a legitimate fund manager activity in London to demonetisation in India in November 2016 just because of the word Doval in my name,” Vivek told MyNation. Vivek Doval claimed that the fund was conceived in 2013 at which time it was impossible for him to know that the BJP would come to power or that it would go in for demonetisation. Ramesh in his press conference had suggested that the corpus of the fund was Rs 8,300 crore which had entered India through the FDI route, but Vivek presented documents showing that the total worth of the fund was just $11 million or Rs 77 crore. According to the documents produced by Vivek, he is among the six investors in the fund, of which one investor has put in 91% of the total amount. The rest are small investors. “I have submitted the names, details, quantum and date along with cheque number of investors and they are all willing to testify to the courts about the source of their wealth and the basis of their investment,” Vivek told MyNation. Vivek Doval invested just $300,000 and his share is 2.7%. “If my hedge fund could become Rs 8,300 crore from an initial investment of Rs 77 crore I would be history’s most successful fund manager in the world. My fund has suffered losses of 20% over the last two years that it has been in operation owing to the market conditions. The current NAV of the fund is $9million,” Vivek said. Regarding allegations of running a web of companies with his elder brother Shaurya Doval, Vivek said, “Since mine is a start-up and it is costlier in Singapore to recruit people for research work, my brother just lent me his office premises that I could use here in India and use Indian manpower for research.” It was on the basis of the recommendation by Gordian Capital that Vivek decided to domicile the fund at the Cayman Islands. “The Cayman Islands is part of the British overseas territory, and the Complainant is a UK citizen. The Cayman Islands, as a matter of fact, is the most popular destination for global hedge funds and to the knowledge of the Complainant as many as some 11,000 hedge funds are listed there, which accounts for over 60% of all the assets in the hedge fund industry. The Cayman Islands is the leading domicile for investment funds, attracting 80% of all new offshore fund formations. Cayman is estimated to house more than 75% of the world's offshore hedge funds and nearly half of the industry's estimated US$1.1 trillion of assets under management as per Connyers, Dill and Pearlman. In addition, Cayman Islands was relatively cheap and efficient jurisdiction in setting up a hedge fund,” the defamation suit said. 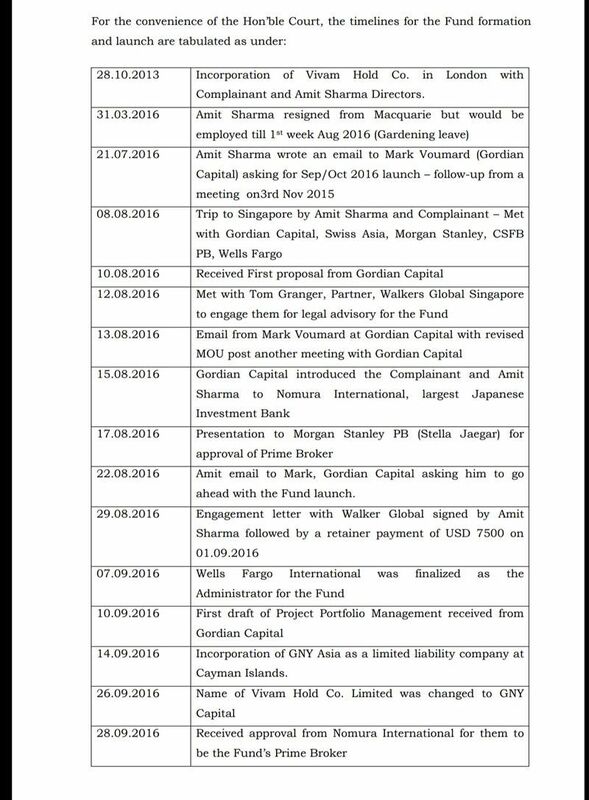 Doval Jr also debunked allegations of round-tripping of money through his fund. “None of my investors is based in India and no funds were raised in India. Not more than 15% or $2 million or Rs 14 crore of the fund was ever invested in Indian markets. Even this exited India in 2017 due to purely commercial considerations,” Vivek said. 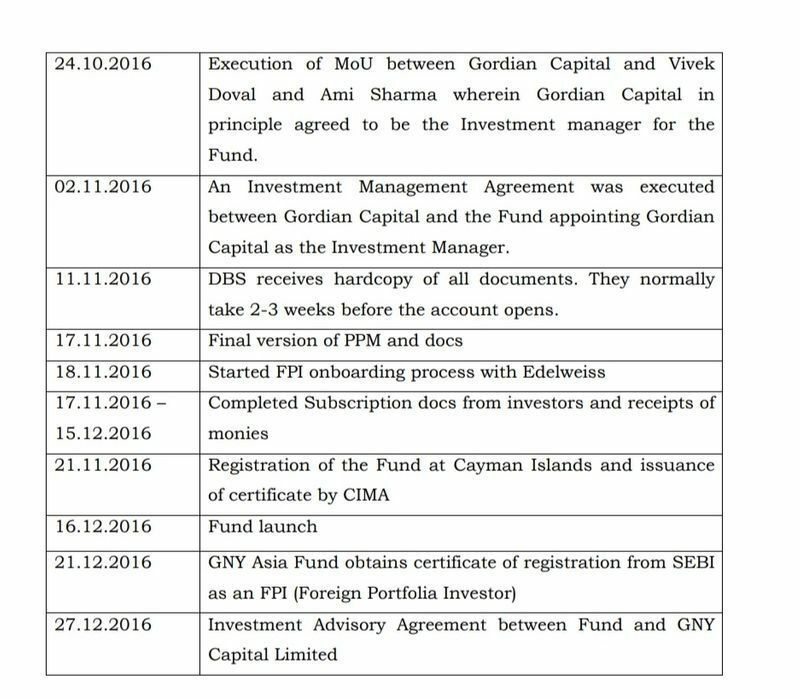 Vivek Doval told the court that his fund was KYC-ed by five top financial institutions. “Nomura International was chosen as the prime broker for the Fund while Wells Fargo International (now called the SS&C) was chosen as the administrator. DBS Bank of Singapore was selected for banking services to the Fund while Price Waterhouse Coopers (PWC) was chosen as the auditor of the Fund. It is clear that only the most reputed and proficient service providers were gotten on board by the Fund. It is also pertinent to emphasize here that most of the service providers adopt the strictest of KYC norms and are known for their compliance records,” he said in his complaint. The complainant has also submitted to the court his salary slips and tax returns for the past 18 years to be “examined by Mr Ramesh”.